Pets Costs > Exotic > How Much Does a Chameleon Cost? A chameleon is one of the most popular types of exotic animals kept as a pet and are commonly found in most local pet stores. Chameleons are well known for its ability to change color, which can act as a defense mechanism or may even happen if they were to become stressed or frightened. Another feature that makes chameleons unique is the ability to move its eyes separately. On average, a chameleon can range anywhere from $40 to as much as $600. The cost of a chameleon will depend on the type, age, gender, quality and where it’s purchased from. At Petsmart, for instance, the veiled chameleon retails for about $80. Refer to our table below to see what some of the popular species cost. What is going to be included in the adoption? If purchased from the pet store and/or a breeder, they should include a temporary housing cage, a health guarantee, a health checkup by a licensed vet and some may even include a small starter kit that includes starter food or coupons. Like any other reptile, chameleons need supplies and a cage to properly take care of them. You can either buy a plain screened cage and all the accessories separately, or you can purchase complete kits that include a lamp, spray bottle, medicine as well as plastic decorations such as leaves. The typical starter kit can cost about $200, while cages on its own can start at $50 depending on the size. The initial setup, aside from the chameleon, can cost $300 to $400. Heat bulbs to maintain the temperature can cost $5 to $20, depending on the type and the wattage. According to chameleonforums.com, a 40 to 60-watt bulb will usually suffice. This bulb will need to be replaced every six to eight months on average. The temperature should stay a consistent 90 to 100 degrees Fahrenheit. Inside the cage, include as many climbing accessories as possible as it’s their extinct to climb. The chameleon’s cage needs to be misted at least two to four times per day. A simple spray bottle can cost less than $5, but if you were to get an automatic misting system, then the costs could be closer to $100 to $150. A gauge is also ideal to keep tabs on the humidity and temperature levels. Factor in recurring costs such as the food, vet visits and accessories. The average chameleon can cost $20 to $40 per month, but an unexpected vet visit can increase the costs. Adults are fed once or twice per day and will eat hornworms, super worms, silkworms and roaches. Its food should also be dusted with a calcium deposit twice per week, which can cost $5 to $15 per container. If purchasing online, additional shipping fees may apply due to the sensitivity to the shipment. Backwater Reptiles, for instance, charges $40 for overnight delivery, regardless of which reptile you purchase. Depending on the species, the average size can range anywhere from 18 to 24 inches, with adults maturing at 12 months old. Avoid placing your chameleon near a window. Experts say that placing a chameleon near a window can actually cause some stress, so it is best to place a tank on a higher surface such as a desk to give it a “treelike” feeling. Consider purchasing aquarium wallpaper. The reason that you may want to do this is that chameleons can often see their reflections in the glass. 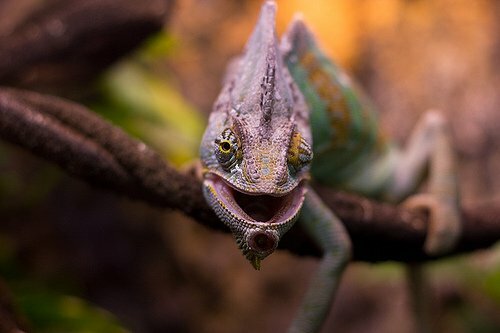 Since they are rather territorial, they can get angry and stressed out if they think there is another chameleon in their cage. While chameleons can be held, experts warn you should wait at least four to six days to allow it to become used to its environment. Red flags to look out for includes weight loss, swelling, lethargy, labored breathing, abnormal feces and non-rotating eyes. According to Petco, common health issues include gastrointestinal disease, metabolic bone/vitamin deficiency, and respiratory disease. Some stores offer packages that will include the chameleon, a cage, and a pack of supplies you will need to start taking care of it. These kits will often be cheaper than purchasing each item individually. Check with local shelters or on Craigslist to see if there is anyone looking to get rid of a chameleon for various reasons. Most of the time, private owners will include the chameleon, the cage, and the accessories for a much lower price.